My alarm went off at 4:30am. It was dark and pouring rain. The rain was not supposed to be happening. It was not in the hourly forecast when I went to bed. I decided to ignore it and go about getting ready for the half. I quickly got dressed, made breakfast and drove over to Sara’s house to meet up with her and Tracey. We spent the entire drive down to Kenosha checking weather and looking at the storm front. We finally got out of the car and wandered over to gear check. We found Krista, Rochelle and Annie in the bathroom. Moments late we found Marty and Matt who came down to cheer everyone on. Tracey, Sara and I headed to the start line hoping to get up to a good start position. Side note here: if you can’t run anything close to an 8-9 minute mile don’t start in the 8 min pace group. Just don’t do it. Anyways, as soon as we started running I wasn’t cold anymore. We started off nice and easy, winding around people to get into a comfortable pace. Around mile 5.5 we were suddenly heading straight into the wind. It was rough. A lovely north east wind coming off of Lake Michigan. We saw Amy at an aid station during the long out and back. I could not wait for the turn around.It never really felt like a tail wind, but it was no longer fight us. A little past mile 9 Tracey and I were both struggling to do running math, but it most definitely looked like we would go under 1:55. Tracy and Sara cross at 1:54:05 and I crossed a few moments later at 1:54:17. My second fasted half marathon to date and a PR for Sara! And for Tracey this was a great test before she rocks the Rockford Marathon in two weeks. The weather was terrible as soon as we weren’t running. We all put more layers on but could not warm up. We got our post race brats and beers, but still couldn’t warm up. We found everyone else at the finish, but just couldn’t stay and cheer on any of the full marathoners. It was too miserable and cold. I spent the rest of the day in my bathrobe and compression socks. It was glorious. Congratulations to everyone else with great races this weekend. It really was stupid cold out there. And the wind slowed me down in the same spot you speak of, and of course when I had zero energy to fight it after mile 20. Congrats on the 2nd fastest 1/2! The cool medal was worth the crap weather! It really was. That is one of the coolest medals I have. I need to use it to open a beer this week. Congrats on your time! It can get SO chilly running in WI rain. P.S. I’m new! 🙂 Looking forward to reading more. Thanks Kim! Hope you had a good race too. Yeah! Congrats on the PR! I was sad we didn’t find anyone before the race, but we hung out in the hotel till the last second. 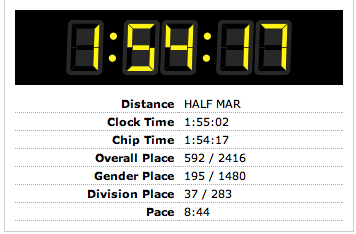 And it seems most people did the half and were gone by the time I finished the full (understandable in this weather). Looking forward to meeting you in person next time!! I wanted to stay, but just couldn’t do it. So, so cold. Congrats on running the full. congrats on the great job this weekend!